Grilled corned is a quintessential dish from summer bbqs. Grilling corn au-natural pairs its juicy sweetness with a crunchy char texture unfound in any other veggie. A few years back, we went to the Minnesoda State Fair and gobbled up several husks of grilled corn topped with butter and Old Bday – so delicious. Back in NYC, there’s this one restaurant, Cafe Habana, that is known for their grilled cuban corn. 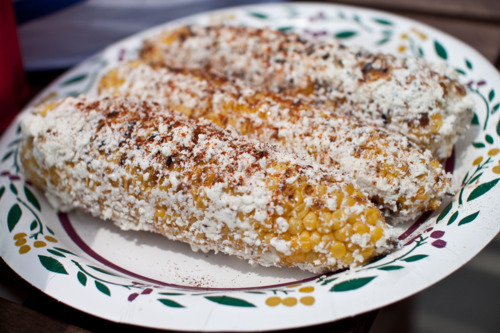 Their grilled corn has always inspired us to make it ourselves. This weekend, we finally had the perfect opportunity. We found a recipe that produced a similar style grilled corn and decided to try it out. It’s listed below. It’s simple, tasty, and affordable. Our guests absolutely loved it – we’re pretty sure each person had at least one whole husks of grill corn. Fire up the grill and get all ingredients ready. Microwave 3 ears of corn at a time in a covered container, 5 minutes. When first batch is done, microwave the second batch. While corn is cooking stir mayonnaise, sour cream, cumin and salt together in a small bowl and set aside. Place grated cheese on a large plate and set aside. When corn is done in the microwave, grill it, turning frequently, until browned in spots, about 10-12 minutes. When corn is done on the grill, attach corn holders to each ear, and, working quickly, smear each ear with the mayonnaise mixture (this is the glue for the cheese), and then roll it in the grated cheese, sprinkle with chili powder and place on a plate. Use whatever chili powder you like, and give it a light sprinkle. You are working quickly because you want the heat of the corn to soften the cheese. Don’t let the corn cool off. Serve immediately, with lime wedges alongside. Squeeze lime over the corn before eating.